The Rockhampton Riverside Precinct has undergone a $36 million redevelopment to help create an interactive urban space for both locals and tourists to enjoy. 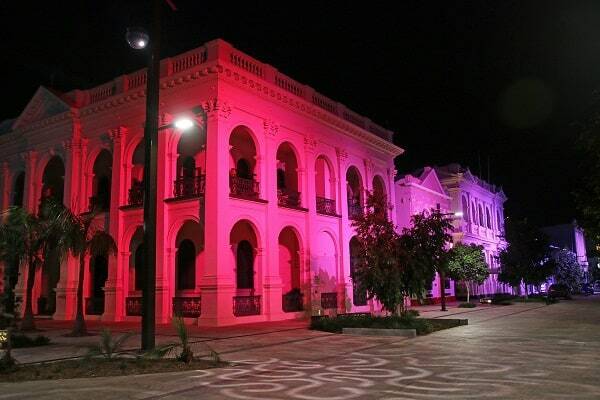 Jointly-funded by local Council, State and Federal Governments, ULA Group’s involvement was to provide the architectural and feature lighting for the heritage listed houses in Quay and Denham streets and surroundings. The ULA Group worked closely with Brisbane based Rixon Design to specify, install, program and commission a new lighting system for the precinct. After conducting several on site tests, 21 Griven Powershine LED RGBW flood lights were chosen to provide the best illumination and coverage of the building facades. Featuring 96 RGBW LEDs, the Griven Powershine fixtures deliver a white light output quality and a wide variety of intermediate colour hues, offering the maximum lighting design flexibility. All the fixtures are linked together by the Pharos Control system with the ability to create dynamic colour schemes and patterns with a few button touches via the live webpage or fixed touch panel. The ULA Group also supplied 17 Tempest Twister 1850 weather Domes to protect the moving lights used within the streets to create dynamic effects and feature lighting. The local Council has already seen the benefits of the redevelopment of the precinct when it comes to hosting new events for the community, giving them an incredible outdoor space that can be enjoyed all year round. “Rockhampton started as a port city on the Fitzroy River and the riverfront has now been reimagined, renewed and re-ignited to once again reflect the city’s central hub and a wellspring for our vibrant future ahead” says Mayor Margaret Strelow.